Follow-up analyses suggest that furries and convention-going anime fans did not differ in the number of friends that they had (and, indeed, both groups reported having significantly more friends than online anime fans or fantasy sport fans). As such, the difference in proportion of friends who are fans between the two groups is driven by the fact that convention-going anime fans have more anime fan friends, not by simply having fewer friends. 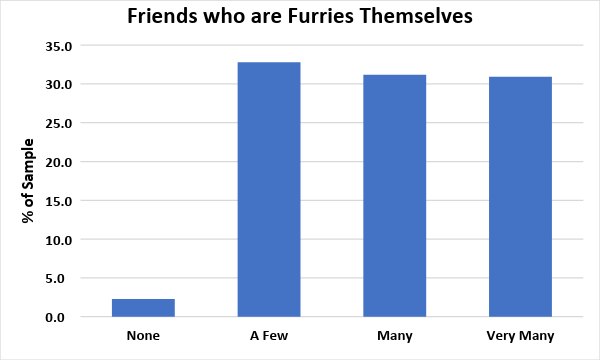 In a recent study we asked participants to what extent their friends and acquaintances tended to be furries themselves. Most furries indicated that some or most of their friends were furries, though a small number indicated that none of their friends were furries. This suggests that furries, at least convention-going ones, tend to surround themselves with others who share a similar interest. This, it should be pointed out, is not at all unique to furries as a group.